By the time he reached the suburbs of Detroit on Saturday, Sen. Bernie Sanders (I-Vt.) had worked himself into a lather of indignation. He was nearly halfway through a 1,200-mile Rust Belt road trip designed to demonstrate his electability in the 2020 presidential election. But the man simply couldn't let go of 2016. Upon taking the stage outside Macomb Community College, Sanders recalled the moment three years earlier when he overcame a 20-point polling deficit to defeat Hillary Clinton in Michigan's Democratic primary. "You know, when we campaigned here a few days before the elections, the pundits determined that there was a 1 percent chance that we could win," Sanders said, sarcasm creeping into his voice. "Mmmm ... Well, we won!" Like President Donald Trump boasting to foreign dignitaries about his Electoral College victory, Sanders can hardly make it through a public appearance without mentioning the 22 states, 13 million votes and 1,700 delegates he won in the 2016 presidential primary. He boasts in his stump speech that he picked up more support from young people than Trump and Clinton combined. And he still complains about the unelected superdelegates who, in his view, tipped the primary toward Clinton. Sanders told his audience of college students and suburbanites that he was "putting a lot of miles on the car" that weekend driving through Wisconsin, Indiana, Michigan, Ohio and Pennsylvania. "And I guess you all know why we are doing that," he said, noting that Trump had defeated Clinton in all five states. "We're here today to say, that mistake is not going to be repeated in 2020." As his opponents crisscrossed the early primary and caucus states of New Hampshire and Iowa, Sanders had come to the general-election battleground that decided the 2016 election. His goal was clear: to combat the narrative that he's unelectable by demonstrating his appeal to Rust Belt voters. "The pervading issue in the race is who can beat Donald Trump," explained Sanders campaign manager Faiz Shakir. "And it's our view on this campaign that ... Bernie Sanders is uniquely positioned to beat him." 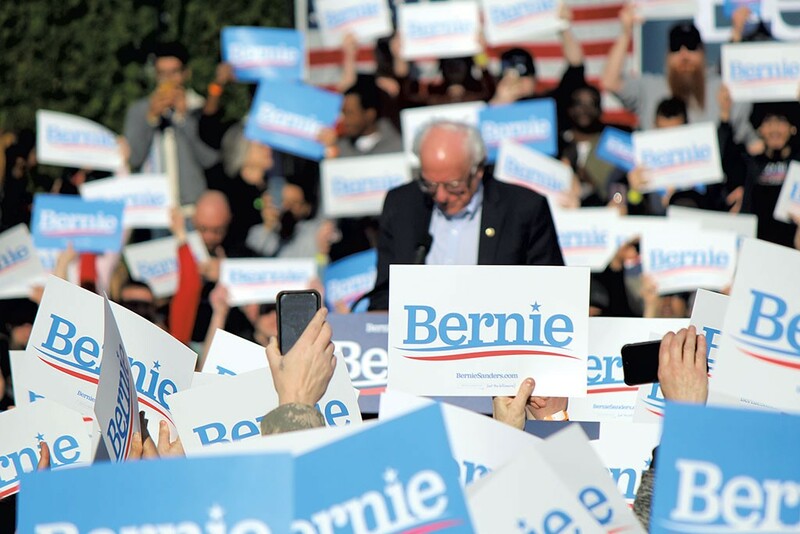 According to Sanders pollster Ben Tulchin, the candidate's "hard-edged, progressive, populist economic message" appeals to the white, working-class voters essential to winning the Upper Midwest. "The manufacturing base of these states has collapsed and isn't coming back anytime soon," Tulchin said. "So you've got a lot of people struggling in these states — and his message really resonates with those kinds of voters." Try as he might to look ahead to the general election, Sanders couldn't help but look back. As his campaign convoy steered east from Lake Michigan toward Lake Erie earlier that day, Sanders chose to publicly reignite an old feud with a top Clinton adviser. In a letter to the Center for American Progress, the senator voiced his "deep concern and disappointment" with the left-leaning think tank for publishing "personal attacks" against him and other Democratic candidates on its affiliated website, ThinkProgress. He specifically targeted CAP president and CEO Neera Tanden, who had been expected to play a major role in a second Clinton administration — and who's known for tussling on Twitter with Bernie bros.
"[Tanden] repeatedly calls for unity while simultaneously maligning my staff and supporters and belittling progressive ideas," Sanders wrote. "I worry that the corporate money CAP is receiving is inordinately and inappropriately influencing the role it is playing in the progressive movement." The Sanders campaign was quick to monetize the dispute. In a Sunday fundraising email to its massive list of supporters, it warned that Sanders was "under attack from the corporate establishment," which it said was "panicked" about the prospect of him winning the nomination. The campaign's ask? A $3 contribution. According to Shakir, CAP has been fighting his boss since the 2016 election. "And I think it was Sen. Sanders' view that we've got to call this out," he said. "We've gotta try to educate folks about the role that they're playing." The campaign, no doubt, was eager to elevate a "corporate" bogeyman to fire up the base and bring in the bucks. A lifelong underdog, the 77-year-old Sanders has found himself in the unlikely role of Democratic front-runner, muddling the outsider image his campaign would prefer to project. But the tactic would seem to carry some risk: Aren't most voters ready to move on from the Clinton-Sanders civil war? Pete Buttigieg seems to think so. As Sanders trained his fire on CAP and Tanden, the 37-year-old mayor of South Bend, Ind., was kicking off his own presidential campaign a few hundred miles away. Calling for a "new generation of leadership," the candidate of the moment proclaimed, "It's time to walk away from the politics of the past and toward something totally different." If voters agree, then maybe Buttigieg or former Texas congressman Beto O'Rourke or Sen. Kamala Harris (D-Calif.) or Sen. Cory Booker (D-N.J.) will seize the Democratic nomination. But Sanders is banking on the notion that what voters really want is clarity and consistency — that they'll reward his steady advocacy for universal health care, a higher minimum wage and an end to economic inequality. "Those ideas that we talked about four years ago, that seemed so radical at the time?" Sanders told his audience as the sun set over the Macomb campus. "Well, today virtually all of those ideas are now supported by a majority of the American people — and they are the ideas that Democratic candidates, from school board to president, are now supporting. "Now," he continued, "our job is to finish what we started." When Sanders kicked off his Rust Belt tour last Friday in Madison, Wis., Maura "Chip" Yost was there to greet him in James Madison Park. The Manitowoc County activist had volunteered for the senator's first presidential campaign and seen him in the flesh 11 times before. "He might even recognize me by now," she said, barely containing her excitement. "Who knows!" 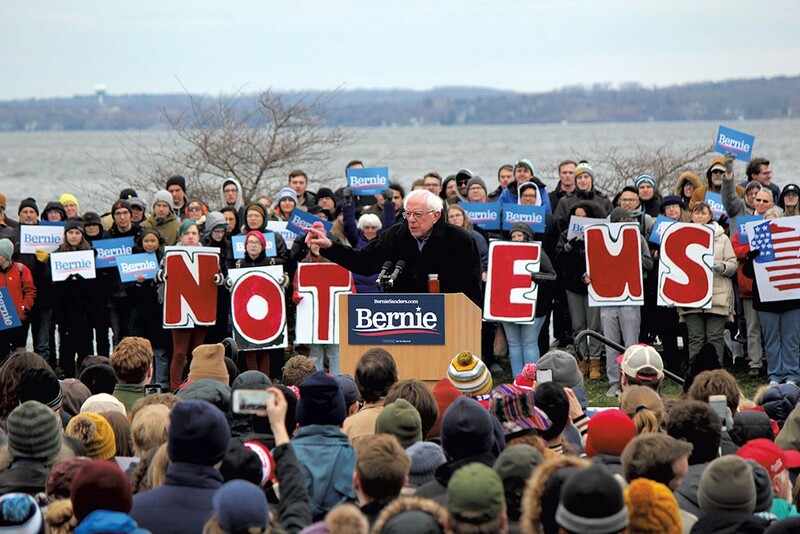 A damp wind blew over Lake Mendota, stirring up an occasional white cap and sending a chill over the sliver of parkland where Sanders was preparing to deliver a 45-minute sermon in 35-degree weather. Yost had come prepared. 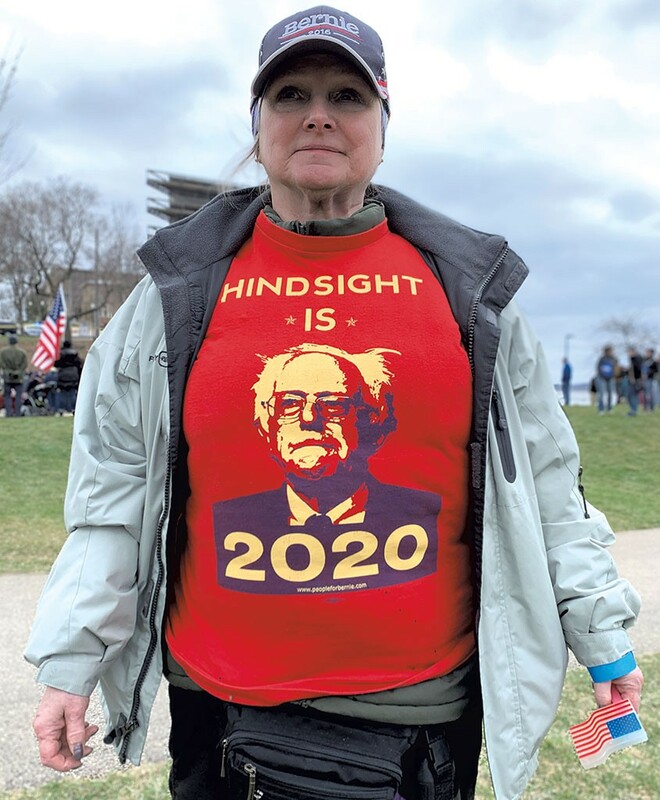 She wore two hats — one featuring the "Bernie 2016" logo — a puffy green jacket, a white parka and, most prominently of all, a red T-shirt emblazoned with an unsmiling Sanders and the words, "Hindsight is 2020." The meme is a favorite of Sanders supporters who remain convinced that their candidate would have beaten Trump if only he'd won the Democratic nomination — a sentiment that would prove pervasive at each of his Rust Belt rallies. "He has the energy that Hillary was never able to cultivate," said Marc Daniels, a manufacturer's representative who traveled to Madison from Springfield, Ill., to hear Sanders speak. "He's got it." Some, such as Daniels, said they'd voted for Clinton in the 2016 general election. Others, such as Yost, wouldn't say. A couple of die-hards admitted that they'd stayed home in November or written in Sanders. Activists aren't the only ones convinced that Democrats blew their shot. Sanders' 2016 campaign manager, Jeff Weaver, has written that it was "painfully obvious" that his boss would have won. "Period." Asked this week if he agreed, Shakir said with a laugh, "You know, hindsight is 2020." The argument goes that if Clinton had picked up a combined 80,000 more votes in Wisconsin, Michigan and Pennsylvania, she would have claimed an Electoral College victory — not just the popular vote. Because Sanders won the Wisconsin, Michigan and Indiana primaries, his partisans say, he could've competed in the Rust Belt in the general election. Never mind that Clinton handily defeated him in Pennsylvania and Ohio — and nearly held on to Michigan. Nor that anticipating every twist and turn of a modern presidential campaign is a fool's errand. Just ask former FBI director James Comey. But the question of how Sanders would fare in the Rust Belt is hardly academic. In a memo released on the eve of the trip, Shakir made clear that Sanders would pursue what FiveThirtyEight editor in chief Nate Silver has called the "Northern Path" to an Electoral College majority: holding all the states that Clinton won, and picking up Wisconsin, Michigan and Pennsylvania. "The easiest path for Democrats to win back the White House is to win back those three states," Tulchin said, noting that the party had prevailed there in gubernatorial and Senate races in the 2018 midterms and in presidential races for decades before Trump's arrival. Sanders isn't the only candidate eyeing the region. The vast Democratic field includes several native sons and daughters, among them Buttigieg, Rep. Tim Ryan (D-Ohio) and Sen. Amy Klobuchar (D-Minn.) — not to mention former vice president Joe Biden, an expected candidate with long-standing ties to the rusty north of Pennsylvania. Others are more likely to pursue a Sun Belt strategy, which would require flipping Florida and picking up North Carolina, Georgia, Arizona or Texas. 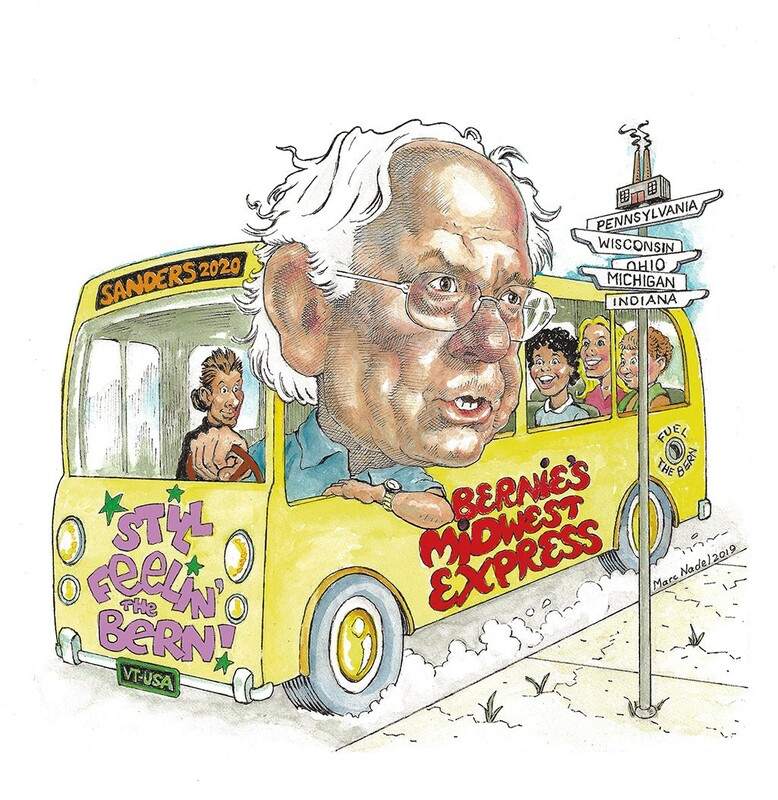 Though winning over this growing and increasingly diverse region makes long-term sense for the Democratic Party, Tulchin thinks that, for now, Sanders should keep his eye on the Upper Midwest. "Bernie is popular there and does well there," the pollster said. "So why not lean into his strength?" 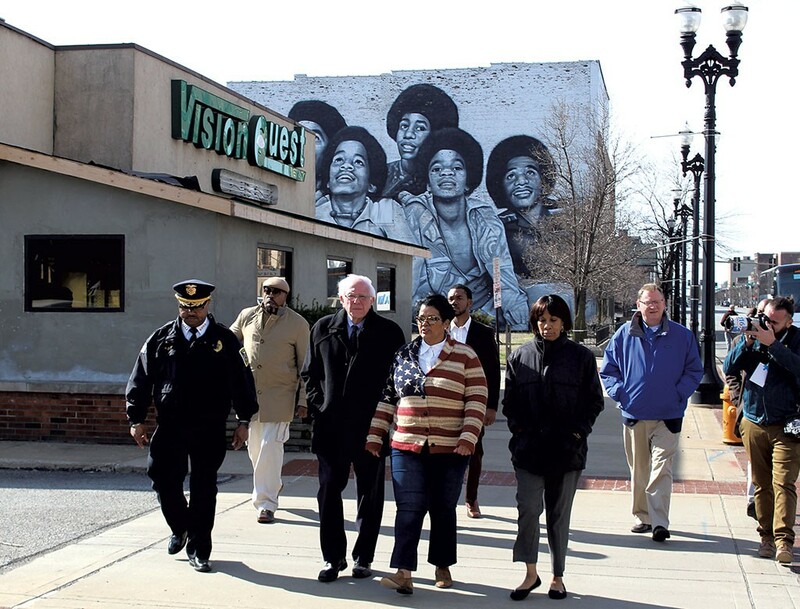 Sanders walked the desolate streets of Gary, Ind., on Saturday morning flanked by a trio of municipal leaders. The city had suffered decades of decline as the local U.S. Steel plant shed more than 25,000 jobs — and it showed, in boarded up storefronts and payday loan shops. Gary Police Chief Richard Allen tried to put a positive spin on the city's fortunes as he escorted Sanders north to a faded convention center. "If you look around, you'll see a lot of buildings that were restored," Allen said. Ever on message, Sanders asked the chief whether the nation's trade policies had contributed to Gary's misfortune. "Trade played a big role," Allen confirmed. Their awkward, forced conversation was interrupted when, all of a sudden, Sanders snapped, "Guys, watch it! Watch it! Watch it!" He was addressing a phalanx of journalists and campaign photographers walking backwards ahead of the group, trying to capture photos and footage of the senator's tour. Every now and again, one of them — including, at one point, this reporter — would collide with a tree or trip over a curb, sending a camera lens hurtling earthward. Sanders did not look pleased. Such is the life of a presidential front-runner, whose every move is recorded and every word parsed. Unlike his first foray into national politics, when he was largely ignored in the early months of the race, Sanders is already a main attraction. The press attention seems merited. A national survey released this week by Emerson College showed Sanders leading Buttigieg, the closest declared alternative, 29 to 9 percent — and even Biden by 5. In the first quarter of the year, the Vermonter raised $18.2 million, more than any candidate but Trump. Most of the money came from small-dollar donors, who are likely to keep giving and could sustain the campaign for the long haul. On the day Sanders arrived in Madison, his aides announced he'd picked up his millionth donation. The cash has enabled Sanders to hire more than 100 staffers and deploy them not only to the likes of Iowa and New Hampshire but to Super Tuesday states, as well. On the streets of Gary, communications aides and press wranglers tried to keep the stumbling journalists in line — and out of the way of campaign videographers who appeared to be collecting footage for future advertisements. Advance staffers directed traffic and scurried ahead to the Genesis Convention Center, where Sanders' next event would take place. An ambulance, for some reason, puttered along behind the entourage. Inside the convention center, some three dozen local leaders took their seats around a U-shaped table in the middle of a cavernous, carpeted event room, lit by a gaudy chandelier. The hastily arranged event had been billed as a "community meeting," but if participants thought they'd be engaging in conversation with the senator, they were mistaken. When Sanders asked for questions from the crowd, municipal employee Rachel Caesar stood to say that she wanted to know what he'd do for "legacy cities" such as Gary. "I'd like to hear that in the context of the Marshall Plan, more specifically the Urban Marshall Plan. I'd also like to hear as it relates to [Rep. Jim] Clyburn's bill—"
"—Why is that a bill that you can get behind?" Caesar continued. "Good," Sanders said, again cutting her off. "Thank you." Rather than answer her query, Sanders moved on to the next questioner and then the next and the next. "OK," he said five minutes later, standing up at the table and looming over the local notables. "The advantage of having a number of people make comments and ask questions, you can kind of lump 'em together. You touched on a whole lot of fundamental concerns." And then the senator launched into his stump speech. Despite the media's interest in covering the five-state swing, Sanders had remained mostly sequestered from the press. So when he opened up the forum to the reporters in the back of the room, Francesca Chambers of the Daily Mail leapt at the opportunity to ask a news-of-the-day question. "Sen. Sanders, you've come under scrutiny this week because you have taken on the millionaires and the billionaires, but you mentioned that you are a millionaire yourself now, having sold a popular book," she said. "Does that conflict with the message that you're pushing here today?" You could almost hear Sanders salivating at the opportunity to smack down such a question. "I don't think so. I didn't know it was a crime to write a good book, which turned out to be a best seller," he said to laughter and applause, adding that he'd consistently advocated for a progressive tax system. "If I make a lot of money, you make a lot of money; that is what I believe. So I don't apologize for writing a book that was No. 3 on the New York Times best seller [list], translated into five or six languages." And then came the scold. "By the way, this bothers me a little bit," he said. "Maybe we might want to talk about Gary. Maybe we might want to talk about poverty. Maybe we might want to talk about youth unemployment ... This might be a great moment to talk about some of those issues." Sanders pointed at another reporter. "And you are with whom?" he demanded. If Sanders' Rust Belt tour was a low-grade sub-tweet of Clinton's 2016 performance, it was also a frontal assault on Trump's tenure in office. At every stop, the senator described the president as a "pathological liar" — and in most places he threw in "racist," "sexist," "homophobe" and "xenophobe," for good measure. Though Sanders claims his campaign is one of "optimism" and "love," his stump speech has grown darker than ever. Unlike 2016, when he avoided naming his Democratic rival, he now has an opponent he can directly attack — as he did most harshly at a pair of labor meetings in Michigan and Ohio. "I am here in the Midwest for one major reason," he told workers Saturday at the UA Local 174 union hall in Coopersville, Mich. "And that is, I'm going to do everything I can to make sure that Donald Trump is not reelected president." Sanders' central argument is that the president duped the American people during the 2016 election. "The most profound lie of all was that he said he was gonna stand with the working class of this country," Sanders said to the assembled plumbers, welders, HVAC technicians and service workers. "That was a major lie and I hope most people know that now." The president, he continued, had broken his promises to protect their health insurance and entitlement programs — and to crack down on Wall Street and other special interests. The candidate didn't have to convince Steve Mutschler, a 34-year-old Marine Corps veteran from Ionia County, Mich., who sat near the rear of the hall. "I'm hoping we can take out Trump's craziness and ridiculousness ... and really take back some of the workers' rights that have been infringed on for quite some time now," he said. Mutschler added that he'd proudly supported Sanders in the 2016 primary, but he wouldn't disclose how he'd voted that fall. He expressed confidence that if Democrats had nominated Sanders that year, the senator from Vermont would have won Michigan — and perhaps the presidency. "I think we just didn't have the excitement with the younger generation [for] Hillary Clinton," Mutschler said. The next day, Clinton's top union supporter during the 2016 election, American Federation of Teachers president Randi Weingarten, introduced Sanders at an AFT forum in Lordstown, Ohio. The town had attained notoriety a month earlier when General Motors idled the local Chevrolet Cruze plant — prompting Trump to lash out on Twitter at the company and the United Auto Workers union. While the president tweeted away, Weingarten said, Sanders had "showed up" and stood with the plant's workers. "You know Bernie," she said in the Lordstown High School auditorium. "He has a clear voice about these issues. He has a clarion message about whose side he is on." When Sanders took the microphone, he lit into GM for taking a government bailout and then outsourcing American jobs. Under a Sanders presidency, he pledged, such companies would be barred from winning federal contracts. "Our job now is to tell them, whether they like it or not, they will be good corporate citizens," he thundered. Sanders saved his most withering criticism for Trump. "I know how tough you are, snatching babies from the arms of their mothers," he said, referring to the president's policy of separating families at the southern border. "Well, let's see how tough you are taking on Wall Street and corporate America!" During a question-and-answer session in Lordstown, Katie Fallo of nearby Niles told Sanders that the father of her young son had been laid off and might soon have to move. Noting the prevalence of "divisive language and communication" in the country, Fallo asked the senator what she could do "to try to bring people together, to show that we have more in common than not." As if on cue, a bearded man wearing a red "Make America Great Again" hat rose from his seat and shouted at Sanders, "You can stop saying the word 'niggardly'!" He was referring, apparently, to a viral video of Sanders using the term in a 1986 speech as mayor of Burlington. The man raised his fist and shouted that Sanders was a socialist as the crowd jeered and security officers dragged him from the room. Once order had been restored, Sanders sought to respond to Fallo. "How do you win elections when you lie? This is how you do it, and this is what demagogues have always done: You try to divide people up," he said. "Our job, to answer your question, is to do exactly the opposite. It's to bring people together." Asked after the forum what she thought of that answer, Fallo called it "phenomenal." She said she'd supported Sanders for years and had, in the 2016 general election, written him in for president and Rep. Tulsi Gabbard (D-Hawaii) for vice president. As for Clinton? "I couldn't press the button," Fallo said. 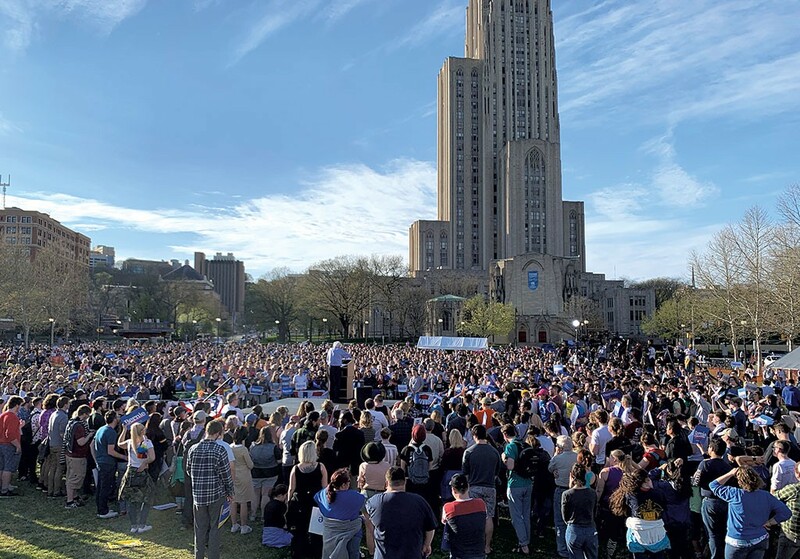 Some 4,500 people filed into Pittsburgh's Schenley Plaza Sunday afternoon for the final rally of Sanders' weekend road trip. Though turnout at his events hadn't matched the stratospheric levels of his 2016 run, it was pretty good for a primary still a year away. Backstage, Shakir reflected on the composition of the crowds: disaffected Democrats, union members, students and other first-time voters. "Those are the types of people who I think Hillary lost in the last election, and they would be there for Bernie," he said. What united them, according to Shakir, was the sense that the rich and powerful don't have their interests at heart — that they're "screwing us, making our lives harder, depriving us of economic freedom and liberty. Bernie Sanders speaks to that with credibility in a way that the rest of the field doesn't." Shakir acknowledged that the campaign still has work to do to convince the party that Sanders is the best candidate to take on Trump. "You not only have to talk the talk but walk the walk," he said. "Travel through the Midwest and show why you think that's the case." The following evening Sanders would do just that. In the battered steel town of Bethlehem, Pa., he brought his message to the unlikeliest of venues: a Fox News town hall. "Not everybody thought that I should come on this show," Sanders told moderators Bret Baier and Martha MacCallum. "Your network does not necessarily have a great deal of respect in my world, but I thought it was important for me to be here and have a serious discussion about serious issues." After noting that the audience included Democrats, Republicans, independents and others, Baier tried to pit the crowd against Sanders and his signature policy proposal: Medicare for all. "If you could raise your hand here, a show of hands of how many people get their insurance from work — private insurance — right now," Baier said. "How many get it from private insurance?" Dozens of audience members raised their hands. "OK," Baier continued. "Now of those, how many are willing to transition to what the senator says: a government-run system?" Nearly everybody who'd raised a hand the first time did so again. Others whooped and clapped. Sanders was walking the walk, and there were plenty of people ready to walk with him.